Sometimes one simply can’t wrap words around the stupidity being played out upon the global stage. Ok, maybe it isn’t actually stupidity. It is definitely conduct regardless of life. I know, maybe it’s NewSpeak. Quarantine now means fly infection everywhere. Sheesh. In the research I have done on Ebola, it seems that the best things short of complete isolation to help prevent it are: oregano oil, general massive immune system boosters including probiotics, food grade hydrogen peroxide ingestion regimens, and hazmat suits. Prayer should be added as well. There may be lots of other things, and I strongly suggest that we all really begin to dig into how to best prevent this virus. It has long been rumored that the Powers that Shouldn’t Be have been striving to weaponize Ebola for years. With the length of incubation and the lower than average kill rate, perhaps that goal has been achieved? An undisclosed number of people who’ve been exposed to the Ebola virus — not just the four patients publicly identified with diagnosed cases — have been evacuated to the U.S. by an air ambulance company contracted by the State Department. How many exposed patients have been flown from West Africa to the U.S.? Thompson said medical privacy laws and his company’s contract with the State Department prevent him from revealing the figure. Five weeks ago, medical missionary Dr. Kent Brantly became the first Ebola patient to be treated in the U.S. He and fellow missionary Nancy Writebol were nursed back to health in a special isolation unit at Emory University Hospital in Atlanta and later released. Dr. Rick Sacra and an unidentified doctor who arrived on Tuesday are currently being treated in the U.S. The State Department confirmed the four known Ebola patient transports but couldn’t provide details on any exposure evacuations to the United States. Phoenix Air, they said, is under contract because of its expertise. Thompson said Phoenix Air has flown 10 Ebola-related missions in the past six weeks. The Centers for Disease Control and Prevention, which is operating an around-the-clock Ebola emergency operations center, did not immediately respond to an email seeking information about the exposure patient transports. On Monday, President Barack Obama, who has called the outbreak a U.S. national security priority, pledged more U.S. assistance to West Africa. The White House recently requested $30 million more from Congress to help the CDC’s efforts with the crisis. With multiple government and aid organizations trying to tackle the unprecedented epidemic, Thompson predicts his team will be flying more precautionary patients back to the U.S.
“There will be a certain number of people who, through no fault of their own, will have an exposure event, and they are immediately identified and immediately extracted,” he said. 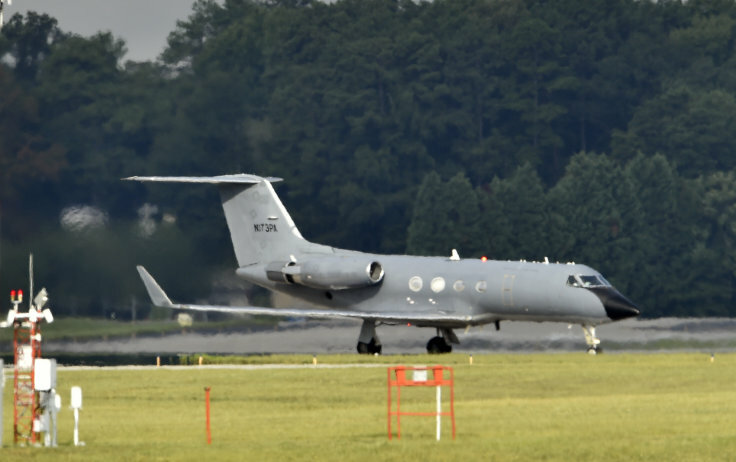 Phoenix Air’s modified Gulfstream III jets are “literally intensive care units with wings,” Thompson said. He said even evacuees without a confirmed Ebola diagnosis are placed in an isolation chamber for the 12- to 14-hour flight from West Africa to the U.S.
“You can never, ever let your safety guards down,” he said. The Georgia-based air transport company got involved in the latest Ebola crisis when the Christian humanitarian group Samaritan’s Purse recruited it to evacuate Brantly and Writebol. The State Department was involved in the logistics, but the trips were funded by Samaritan’s Purse. Since then, Thompson said, Phoenix Air has solely been under contract with the State Department. “It became evident that we could no longer treat any of these flights as a private or commercial flight,” said Thompson, declining to divulge the specifics of the government contract. Brantly, Writebol and the latest patient have been treated at Emory University in Atlanta. Last week, Sacra was flown to the Nebraska Medical Center in Omaha. Those hospitals, plus the National Institutes of Health in Bethesda, Maryland, and St. Patrick’s Hospital in Missoula, Montana, have specially-equipped biocontainment units built in collaboration with the CDC. However, the CDC has said any U.S. hospital following infection control recommendations and isolating a patient in a private room is capable of safely managing an infected patient. Thompson declined to say where patients who have just been exposed to Ebola have been flown to in the U.S.